This is also the first review where I am providing my own in-game screenshots. 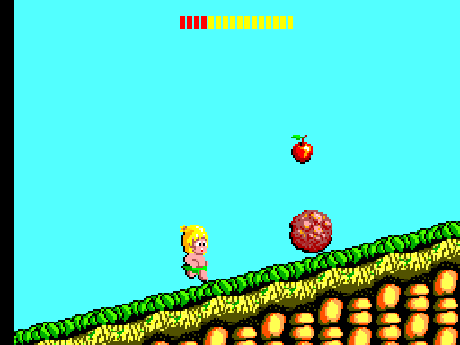 Wonder Boy is a simple game. It does not offer much of a story – you’re given a simple goal and there is a bad guy you must ultimately topple to achieve it. In this case, as the blond protagonist Tom-Tom, your goal is to rescue your girlfriend Tanya, who has been kidnapped by the evil Drancon. 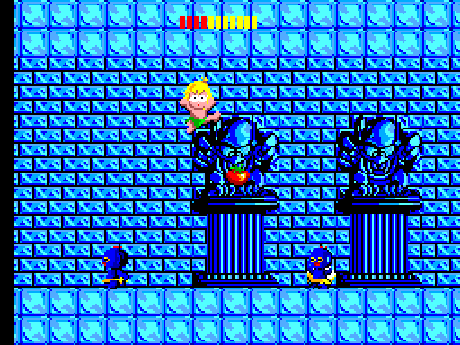 And that’s it – one hardly expects more from an 8-bit platformer from the 80s. 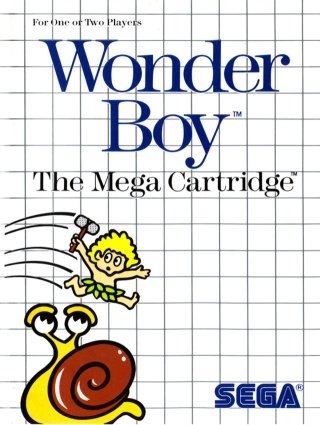 Wonder Boy does not do anything in particular that had not already been seen by 1986. Each of the areas is broken down into 4 rounds, and at the end of the fourth round you face the area’s boss. Each of the rounds in turn has 4 checkpoints, which will be quite helpful, as you start from the last one you’ve reached when you lose a life. If you lose all your lives and choose to continue, though, you start from the beginning of the round. And trust me, you’ll be seeing that Continue screen often. The good news is that you’ve got unlimited “credits” here, so you can just persevere until you beat the game. Gameplay works in a simple way – you press forward to run, you can’t go back to parts of the screen that you’ve left behind, you have normal jump with button 1 and big jump with the same button, but after holding button 2. There are many obstacles along the way – enemies both static and moving towards you in various patterns (touching any of them means you die, of course), rolling rocks, fires, falling stalactites in ice cavern stages… It is a difficult game. Many times, you’ll see yourself failing, and some of them, you’ll think it’s unfair because an obstacle appeared out of nowhere. But once you learn the pattern, things become manageable. It’s not really an unfair challenge. 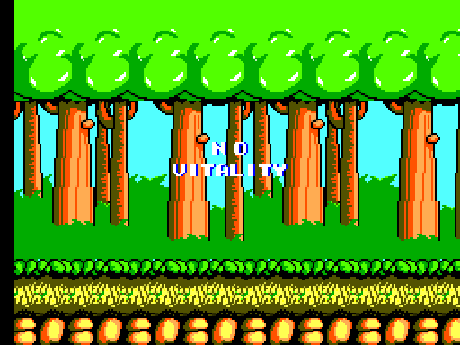 The difficulty increases gradually and reaches a cap in the latter half of the game, with each of the last couple of areas not being much more difficult than the one before it. 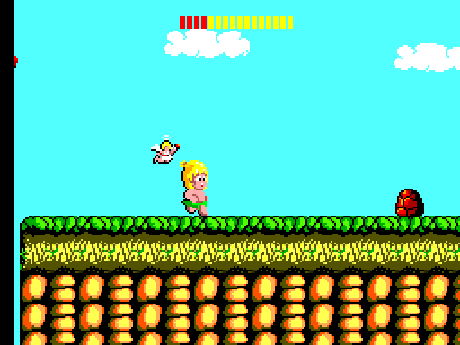 As you have noticed on the screenshots, Wonder Boy also features a health system. Sadly, having full health or close to it does not save you from dying when an enemy or a rolling rock hits you. The health bar merely signifies for how much longer you can go unless you eat additionally or clear the stage. Eating each of the various foods that present themselves to you out of thin air as you approach grants you a certain amount of health. Health depletes as time passes, and there are also small rocks on the ground that aren’t deadly to the touch, but drain your health badly as you trip on them, not to mention that you need a second to recover which could be fatal if an enemy is nearby. A succession of 2-3 such rocks (tripping on one causes you to trip on the following ones before you can recover) can bring you pretty close to death (yes, as you’ve figured out by now, running out of health is an additional way to die). You are not completely helpless in such a hostile environment, though. The game offers power-ups along the way, hidden in big eggs. The first and the one you’ll be making the most use of is the stone axe. 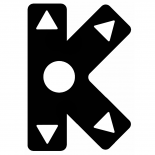 It’s vital help, as you can use it to destroy enemies and it’s also the way to beat the bosses. Not having an axe in certain areas increases their difficulty a lot. Naturally, once you die, you start without one again. Another powerup you’ll be using less frequently (simply because it requires you to already have the axe before reaching it, otherwise the egg just yields an axe) is the skateboard. Once on it, you automatically scroll forward, which can also be a bad thing, especially if there are pits around. You still get to use your axe as you please, but it’s not as easy to aim while you’re moving. By pressing back, you can slow down the pace a bit. At least the skateboard makes you immune for one hit, after which you lose it. The third powerup is the best. As you break the egg, an angel appears and accompanies you for a certain period of time (usually enough to make it between two checkpoints! ), making you invincible against all enemies and obstacles! That way, you can march forward and just crush everyone (even fires). The only way to die is to fall into a pit. There’s also a powerdown – instead of an angel, it’s a devil/death-like figure that also accompanies you for a while and drains your health rapidly in the process. Fortunately, it can be easily recognised, as its egg is covered in spots. Sometimes, it can be difficult to avoid such an egg, however. There are also bonus segments throughout the stages. Sometimes, when you pick up a fruit, underneath it, a woman’s accessory will appear (shoe, purse, perfume, etc.). If you pick that up, a girl appears that teleports you to a bonus stage in the sky, full of hearts to collect. If you clear the stage successfully (exiting via picking up the same accessory), you advance to the next checkpoint in the round. If you fall down, you are returned to the previous checkpoint. In each of the rounds, there is also a doll that looks like Tanya to be collected. 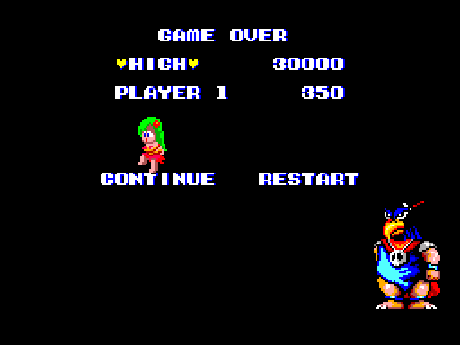 It doubles your “Round Bonus” at the end of the round, and, if you collect ALL of the dolls throughout the game, you unlock a hidden area after the final one. Sometimes, they are in plain sight, but sometimes they are hidden very well, so collecting all of them unless you already know their locations is next to impossible (I could not do it in my playthrough). Once you clear all the obstacles in a round and reach the “Goal” sign, you’re treated to a satisfying “Round Clear” screen and upbeat music. Unfortunately, boss battles are an area where the game lacks. You encounter Drancon at the end of the fourth round of each area, and he’s much bigger than Tom-Tom and intimidating, but his movement and attack patterns are very easy to master and, once you do so, you’ll practically have no problem with the boss battles unless you mess up yourself. When you win the fight, Drancon’s mask falls off revealing another one, and he flies away only to await you at the end of the next area. 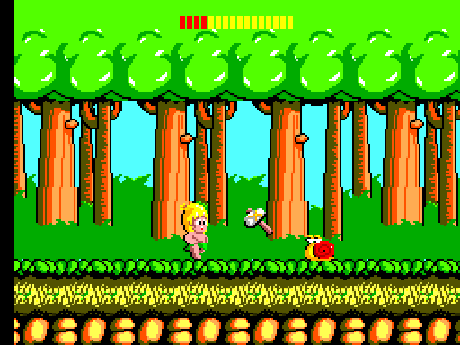 Wonder Boy is a pretty game, considering when it was made. Sprites are pretty, character and enemy animations are smooth. The game gets the details right – for instance, if you jump, the exact moment in which you throw your axe will determine how far it will go in its nice parabola. 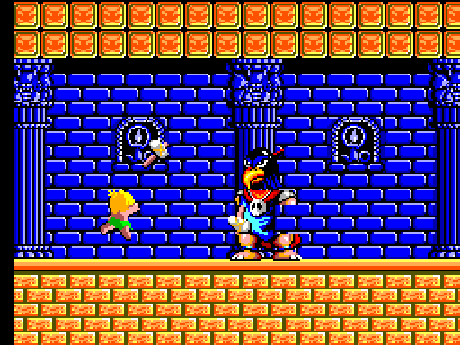 At the time, many platformers were much rougher around the edges. The music in Wonder Boy is very repetitive – the same tune throughout the first three rounds of an area (except while you’ve got an angel or devil with you), then a different tune in the fourth round and another one for the boss battle (two boss themes alternate). The bonus round has also got its own theme. Overall, the tunes are nice and memorable, though. While repetitive, they never get really annoying. 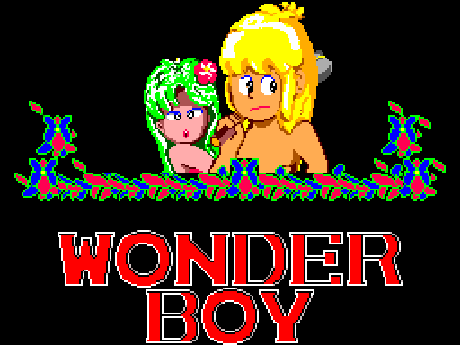 The Wonder Boy music I’ll share with you and my personal favourite is the main theme which plays during rounds 1-3 of each area. Do not let the score intimidate you – again, I use 5 as average, and the game is great for bursts of quick fun. The challenge is significant, but there is also a nice feeling of achievement as you listen to the “Round Clear” music at the end of each round. 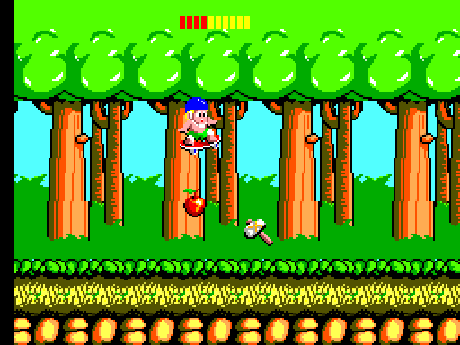 Wonder Boy is one of the finest early platformers of the 8-bit era. 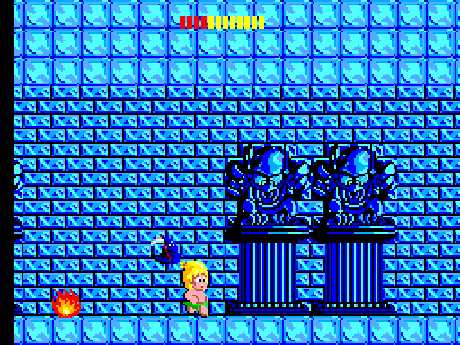 Fun fact: Wonder Boy even had its blatant rip-off in Hudson’s first Adventure Island game for the NES. Bottom line, if you are thirsty for some 8-bit fun, do give this gem on the underappreciated SEGA Master System a shot. And look into the whole series, while you’re at it – there’s much to be discovered. Great review as always. I really appreciate 5 being average since that’s how I always wind up reading the numbers in the first place!